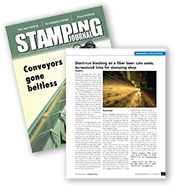 All-New Stamping offers custom precision progressive stampings for all industries. Our in-house tool and die staff will design and manufacture a high quality progressive die to ensure that the finished part meets your exact specifications. We have the expertise to ensure that your part will be manufactured to your requirements and to the highest quality standards. Progressive stamping is ideal for high volume production runs. Using sequential stations in the same die, parts do not require transfer to multiple stamping presses, reducing handling, processing time and costs. These factors offset the higher initial investment in the design and manufacture of the progressive die used during manufacturing. Custom progressive dies designed and manufactured by All-New Stamping’s tool and die department. Our staff will work with you to develop a high quality progressive die that will efficiently manufacture your part. Complete stamping services, including blanking, coining, bending, drawing, forming and piercing. Expert stamping of a wide range of materials, including steel, aluminum, brass, stainless steel, sheet metal, copper, brass, plastics and specialty metals. All our materials are traceable, with full certifications. We can provide environmental statements if required. All-New is happy to provide you with precision progressive stampings for your high volume needs. Let us provide you with the power satisfaction that adds value to your project from the initial consultation to the finished production parts.